"I en tid, hvor online video fylder vores feeds, og kvaliteten af indholdet samtidig er støt stigende, skal der meget til, for at bryde igennem contentmuren. I et stærkt felt af indsendte arbejder, var The Road to Recovery i periferien af shortlisten. Men da voteringen gik i gang, og banen blev kridtet op, stod det klart, at FCK og Unibet havde nogle kvaliteter, som bragte dem foran til sidst. Kort fortalt – En gennemført og modig produktion, der viser styrken i, at benytte video til at aktivere på tværs af platforme." Having partnered with F.C. Copenhagen since 2012, studies had shown that Unibet, the official betting partner of the football club, had reached a stand-still in both brand awareness and preference amongst fans of the team. Challenging this status quo, we needed to strengthen ties between the two brands through activation. As the club presents a very rich fan community with entertainment offers ranging from front-row game coverage, daily insights, video portraits, articles, competitions etc., we knew that we had to aim higher to truly gain awareness and preference for Unibet. Through previous experiences, we had found that the results of our activations were greatly affected by the performance of the team. I.e. if the team was losing, our activations were not received as positively and the results would suffer from it. Such is the nature most often for sports partnerships. However, we wanted to explore the opportunity to create an activation that would transcended the performance of the football team and unite fans around a common goal. Further, we believed that if the right activation was created, the partnership could be leveraged to gain national awareness for Unibet and the partnership. Having experienced success with branded video content, we knew that this would be our path. However, since FC Copenhagen fans were already being offered arguably the best club TV in Denmark (FCK TV), we needed to go bigger than ever before. Through a series preliminary meetings with Unibet and FC Copenhagen, we sought out a story that could captivate and unite fans around the country. We set our sight on the story of Bashkim Kadrii. 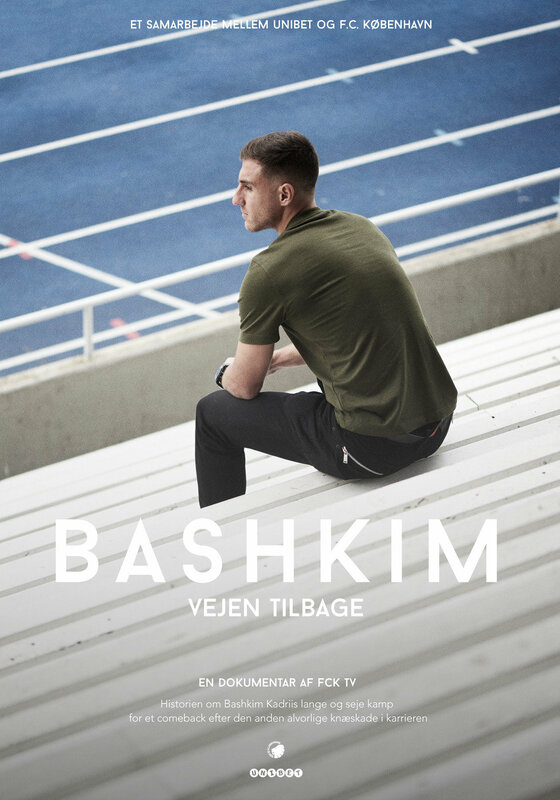 Setting the bar higher than ever before, we spend an entire year working on a documentary, which offered fans full access into Bashkim Kadrii’s road to recovery after suffering the second severe knee injury of his career. The story would develop organically as we did not know how Bashkim's rehabilitation would go. We toke this risk willingly. We followed the popular footballer through rehabilitation - the ups and downs, the mental struggles, the endless tests, visiting specialists abroad and finally, the much anticipated comeback to the highest level of play. We visited his home, sought answers to where is drive came from and interviewed his teammates and club staff. This production spared no attention to detail with exclusive access to surgery, custom made sound design and top of the line color grading. We teamed up with a local movie theater, Park Bio, located next to the home field of the team, and ran the trailer in the weeks leading up to the big online release. We then aired the film exclusively for season ticket holders at a galla premiere. This event aimed at striking the very core of the fan community. We covered this event to give additional airtime to Unibet and shot video reviews from fans and players of the team. All other fans were invited to see the movie at the theater the following week. Unibet covered the price of admission and the movie sold out four days in a row boosting the hype around the online release and creating goodwill for Unibet. To reach our target audience online, we leveraged the sizable audience on the social channels of FC Copenhagen. Over a period of four months, we strategically shared campaign content (trailer, videos, articles, pictures) on Twitter, Instagram, Facebook, YouTube and SnapChat. A total of 57 social posts were created. The 35 minutes long documentary titled 'Bashkim - The Road to Recovery" aired in October. With more than 1 million social impressions delivered organically and more than 18.000 engagements on the social media channels of FC Copenhagen, the campaign was a huge success for both Unibet and the football club. The video content we created captivated football fans and generated more than 150.000 video views online and in the excess of 500.000 minutes of played video content on YouTube and Facebook. That is equal to 8.401 hours of viewed video or a constant stream of campaign content for 350 days. As a result of the high quality of the content creation, we managed to capture the attention of the wider sports community and MTG aired a preview of the film in their post-Superliga show ‘Onside’ (TV3 Plus) with more than 110.000 viewers on the night. They then proceeded to air the full documentary on the TV3 Sports Channels three times in the following week. Hereby, the campaign successfully re-invigorated the 'earn media' category and brought national attention to the film and to Unibet. The campaign reached the desired target audience with 93% of F.C. Copenhagen’s Facebook followers having been exposed to assets from the campaign. Unaided, 80% of F.C. Copenhagen fans connected the film to Unibet and when asked how they felt about Unibet getting involved in this manner, 93% where either positive or very positive. Finally, an impressive 93% of the fans wanted to see more of these activations going forward. With a commitment to bringing novelty to sports fans, we spend an entire year preparing the largest content production the sports community of Denmark had seen in years unknowing of what the finale story would look like, but it paid off in a big way. On the 23rd of September 2015, Bashkim Kadrii was re-introduced to the squad for the game against FC Vestsjælland. His selection marks the results of an incredible journey and we remain thankful to him for allowing us to cover his road to recovery. *All data can be supplied on demand.